I’ve been reading through a stack of books I imagine the thirteen-year-old girl in my latest Work in Progress would have read in 1965. 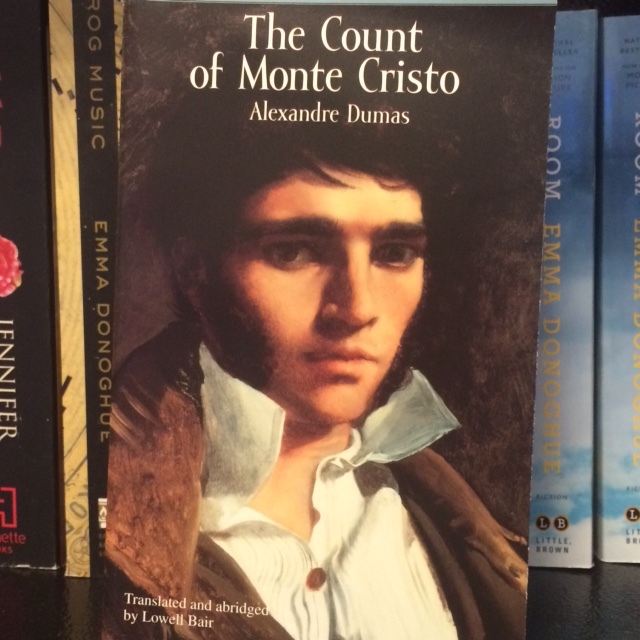 She has – I mean I have – just finished The Count of Monte Cristo by Alexandre Dumas. I loved it and only wish I’d read it earlier in my life, back when my mental retention worked better. There are so many characters of whom to keep track. They have French names, Italian names, bandit names, and use first names, last names, or nicknames, or titles, or their professions. Even the servants have several names each. The Count himself is known as Sinbad the Sailor, Zatara, Lord Wilmore, Abbe Busoni, and, of course, his given name, Edmond Dantes. During the time I was reading the book, I came across the 2002 movie version on HBO and DVR’d it. When I had finished reading, I looked forward to seeing the film adaptation. The movie starred Jim Caviezel, Guy Pearce, Henry Cavill, and Richard Harris and, in spite of the stellar cast, was disappointing. In fact, I did not like it at all. I had to laugh at myself for my reaction. I mean, the book was published in 1845 and the movie made in 2002, and yet I thought Alexandre Dumas must have rolled over in his grave. I was appalled at the movie version. It is such a wonderful book, it’s a pity it didn’t come across in the film. For me, anyway, as a new fan of this novel. But isn’t that proof of immortality, that 172 years later, someone reads Dumas’s novel, loves it and is insulted by the film adaptation? Wouldn’t that be wonderful? It doesn’t matter when it was written and published, or how language has changed, or how different stories were written. I always say I just love a good story, but I amend that, because it’s not just the story, but the telling of the story. Alexandre Dumas could tell a story. If I weren’t writing the middle grade novel I’m working on now, I may never have had a reason to pick it up. I am searching this stack of classics for quotes to use in my book. I want to start each chapter with a quote from a book my character would have read. Helpful friends have suggested that I just Google quotes, and that I don’t need to read the entire book. But I tell them I want the quotes to have context. And truth be told, I want to read these books. They are classics for a reason. I read the entire, very lengthy, character-full The Count of Monte Cristo and found the perfect quote on the very last page. And if I hadn’t read the whole book, it would have meant nothing. That’s fantastic! Love that you found your quote on the last page~how perfect is that?